Sweet Potatoes Fries recipe by bestchefs at PakiRecipes.com. A sweet twist on french fries with less calories than regular fries. Prepare a baking sheet lining it up with foil or wax paper. In a seperate bowl put wedges of s.potatoes and all other ingredient and mix it well with hands. 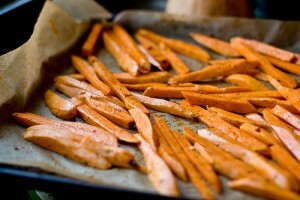 Check fries often how crispy or how mushy you want it and than take it out.